In 1986, two British fellows obsessed with dance music released ”Please,” an album full of meticulously engineered beats and infectious songs that weren’t nearly as silly as they first sounded. Twenty years later, Neil Tennant and Chris Lowe are still the Pet Shop Boys. And they have aged surprisingly well. They came to Radio City Music Hall on Saturday for a sold-out concert, which may surprise listeners who associate them with only their 1980’s hits: ”West End Girls” and the rest. The concert was a reminder that these two have kept busy, recording elegant pop songs that often manage to be sly and silly at the same time. In Britain, where they have remained pop stars, their albums invariably crack the Top 10. In the United States, judging from Saturday’s show, they attract an appreciative crowd in which women are a distinct minority. 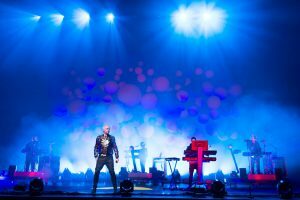 The most recent Pet Shop Boys album is ”Fundamental” (Rhino), which reunites the duo with the pop producer Trevor Horn. It’s also an explicitly political album: in ”I’m With Stupid,” Mr. Tennant, who is gay, imagines the unhealthy (but passionate) relationship between George W. Bush and Tony Blair. When he sang the song on Saturday, the satire seemed pretty hackneyed, but the love story still sounded intriguing. ”Fly across the ocean/ Just to let you get your way,” he sang, sounding less like a Labor leader and more like your average sad-sack boyfriend. The duo’s current tour, with a brilliant stage set by Es Devlin, emphasizes the members’ love of machine music. For most of the night, Mr. Lowe’s small keyboard was the only instrument onstage. (As a rule, he doesn’t sing, talk or move.) And while Mr. Tennant worked the stage, sometimes trailed by two dancers and three singers, images and letters and colors were projected onto a big white cube that split into three square panels, which were nimbly arranged and rearranged by two stage hands in white hazmat suits. On albums, Mr. Tennant’s thin, ultranasal voice sounds great on top of those thin electronic beats. Onstage, though, he sounds — well, he sounds like a guy who is smart enough to make sure there are plenty of visual distractions. During ”Minimal,” an oddly engrossing song from the new album, he exhaled the simple words (”M-I-N-I-M-A-L/ Minimal, minimal”) over a suitably skinny-sounding track. Then the two segued into ”Shopping,” an old favorite in which Mr. Tennant also spells out the titular word; this show is nothing if not well planned. Somehow the Pet Shop Boys manage to do just about everything — from crooning a ballad to covering the Village People (”Go West”) — with raised eyebrows. Even when they’re making a deplorable visual pun (they wheeled out giant Chris-and-Neil heads, perched a dancer on top of each one, and did their version of ”Always on My Mind”), they looked suave and lovable. And if the best thing about the show was the design, well, you might say the same about the Pet Shop Boys’ music. And you might mean it as high praise.